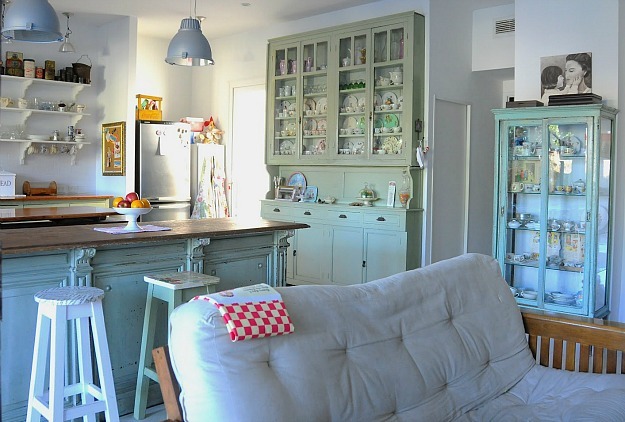 Welcome to Silvina’s kitchen in Argentina, where her love for vintage collections and antique furniture is on display. It’s a charming mix of new and old. Take a look! 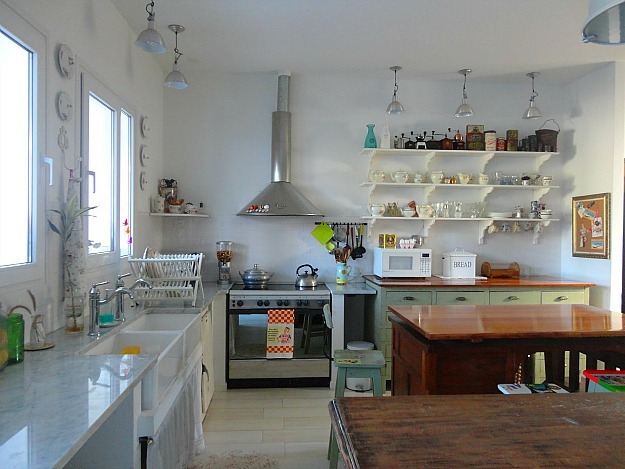 Thanks to Silvina for sharing her kitchen in Argentina with us! I love hearing from readers in different parts of the world, and it’s inspiring to see how resourceful she was in making her kitchen her own. For more photos and information visit her blog Tazas & Cuentos (Cups & Stories). 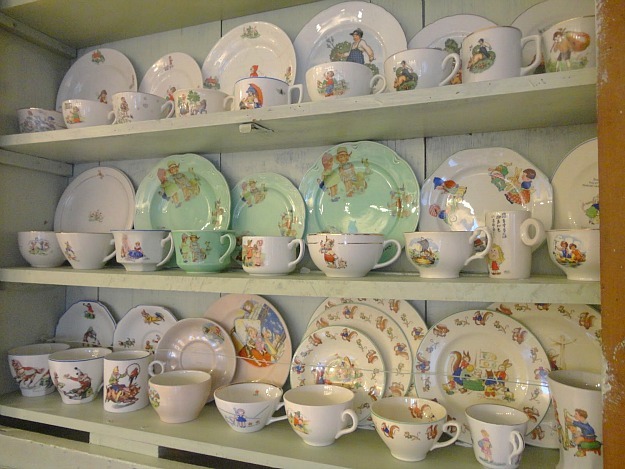 Great vintage charm – delightful collection of children’s plates! 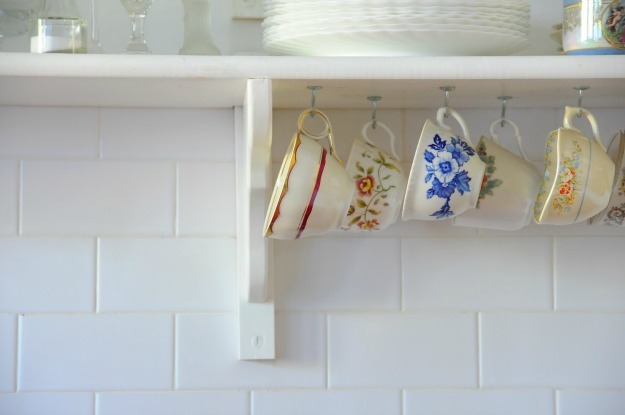 The old cupboard looks perfect in there – like it is built right in! 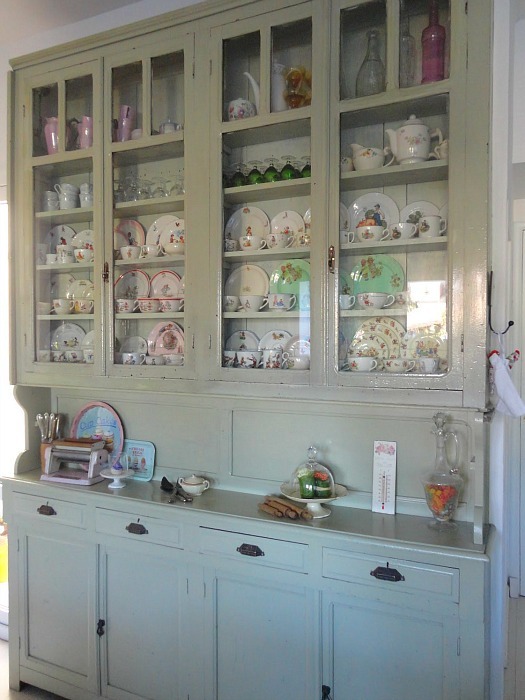 love that old cupboard and the collections! Already this is one of my all time favorite kitchens. If only it were mine! You torture me by posting amazing kitchen after amazing kitchen. But this one! This is it. There isn’t a single thing I don’t love. The light, the windows over the sinks, the table, just the feeling. I hit me as I browsed the photos – there is nothing here that doesn’t have meaning, that isn’t loved and used. I will never get this room out of my mind. I feel exactly the same way! All of these kitchens are perfect enough to weep over. I can’t think of anything else to say except “ditto”!!!! Silvina, I love how you put your great kitchen together. Peeked in at your blog and saw some great ideas there, too! How great is that kitchen? This is beautiful, charming and very, very warm. Beautiful kitchen! I love the vintage furniture and dishes, love the colors with the white, the sinks, the marble counters. Very large and light, but homey too. also – LOVE that she has no built in cabinets!!! Great job getting everything organized so perfectly! 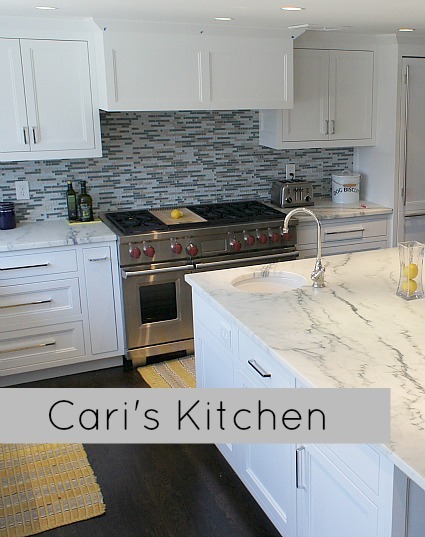 I LOVE this kitchen… so full of personality and a place to really enjoy spending time! Thanks for sharing! Amazing kitchen! You can tell how much thought she put into it. The vintage finds really make it special. So lovely! The collections of china and other things are beautiful on display and give the room such a warm, homey feeling! 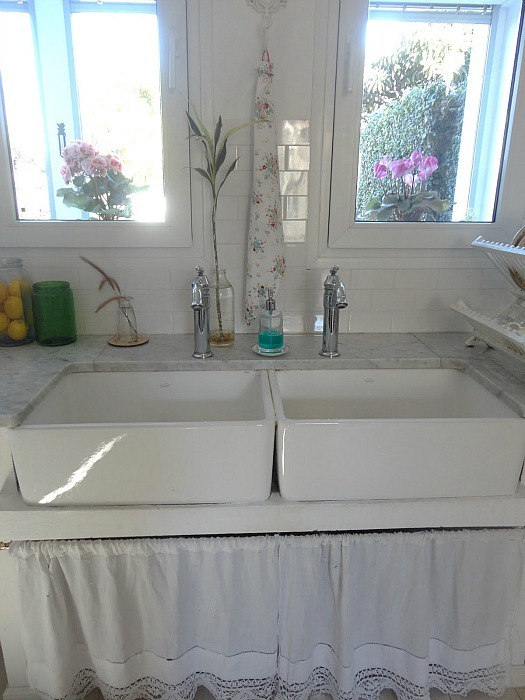 I love the double farm sinks as well….very clever idea. 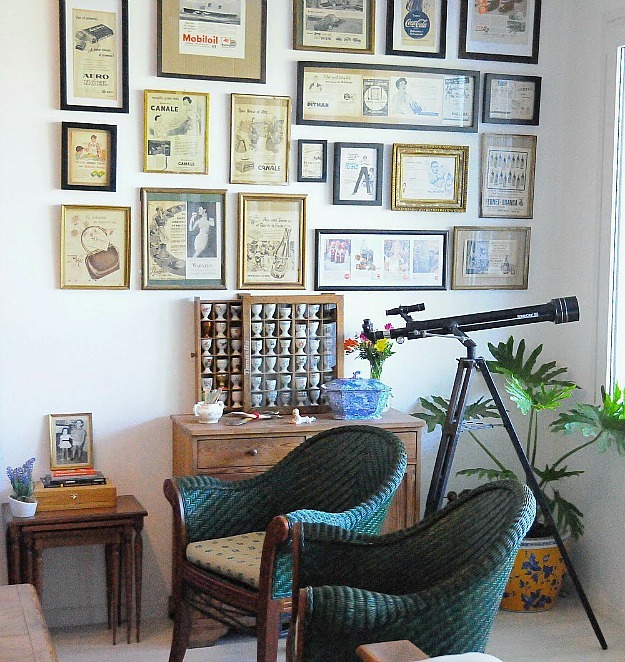 A very sweet and charming space! 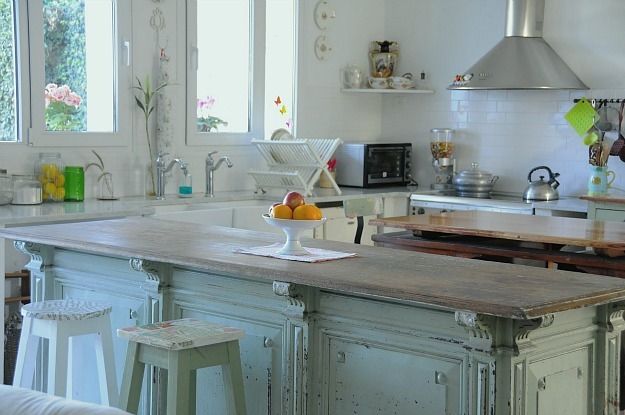 Love this vintage-looking kitchen! So neat how her daughter is using the table! Oooh, I love it. Homey and real! This is such a fabulous kitchen! Love all the vintage touches and the sense of history they have created. Well done! 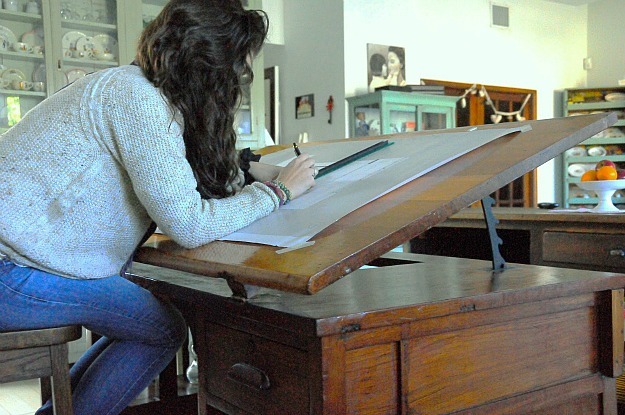 The drafting table as a kitchen table is an unusual and interesting idea. I wouldn’t think more than two people could sit at it comfortably, though. I’ve passed over lots of those at business liquidation auctions. Computers have largely replaced hand drafting, so scores of them have been discarded. I love this. It feels like a kitchen in areal home to me and I’d never tire of looking at the vintage children’s dishes, ads, and more. I’d feel comfortable there, nice and cozy. So personal, so unique! Absolute.y charming. This is absolutely one of the most charming kitchens I have ever seen, I love the personal touches but especially the children’s dishes. Wish this kitchen was mine. Just beautiful! Love the children’s dish sets. I thought I was the only crazy person with lots of children’s dish sets. I have used them for baby showers! I have a few of the same ones you have. Your kitchen is art. I love kitchens that don’t have built ins. I love the choice of white marble. Love farm sinks. Love your colors. The epitome of “repurposed”. I’m in love with this kitchen. Everything has a function and yet it’s all so beautiful. I love collections on display and she has used her collections to add colour to such a bright space. I have one word for this kitchen – “covet”. In love with this kitchen! She is so resourceful too.Love those children’s dishes. I love all the collections and the shop counter and cabinet are fantastic. Love the colors and the ingenuity. Oh! You can’t imagine how happy I am looking at this post! You made my day! my week…! It’s a honor for me to be here in your fabulous blog. I always enjoy visiting you and encourage my friends to do it, I specially love all your posts about films and series houses. Thank you very much, Julia and a big hug (“un gran abrazo”) from Argentina. This is just beautiful. 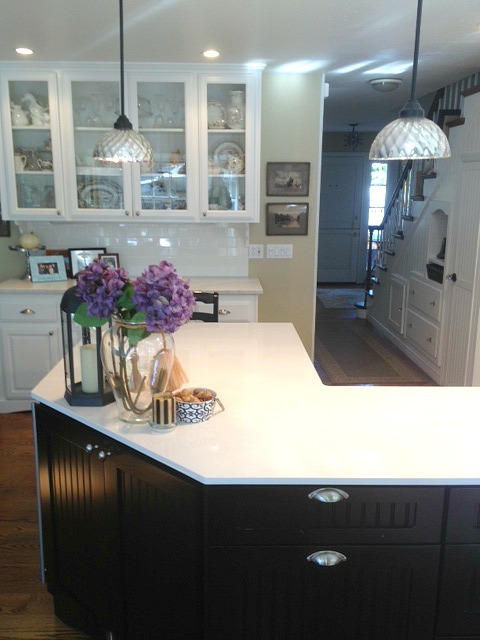 Love the counters…what a fun mix! Could look at the pictures all day. Love all the quirky details in this kitchen! It is apparent that much thought went into the renovation. 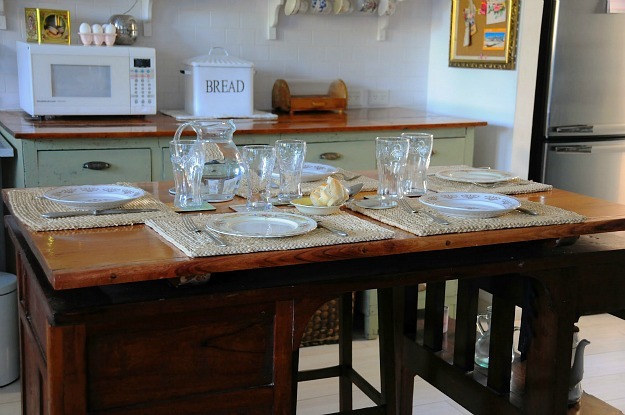 It is so refreshing to see a functioning kitchen with charm and personality shining through. The children’s dish collection is the perfect finishing touch! Love the picture feature wall. The vintage newspaper ads are a great idea! 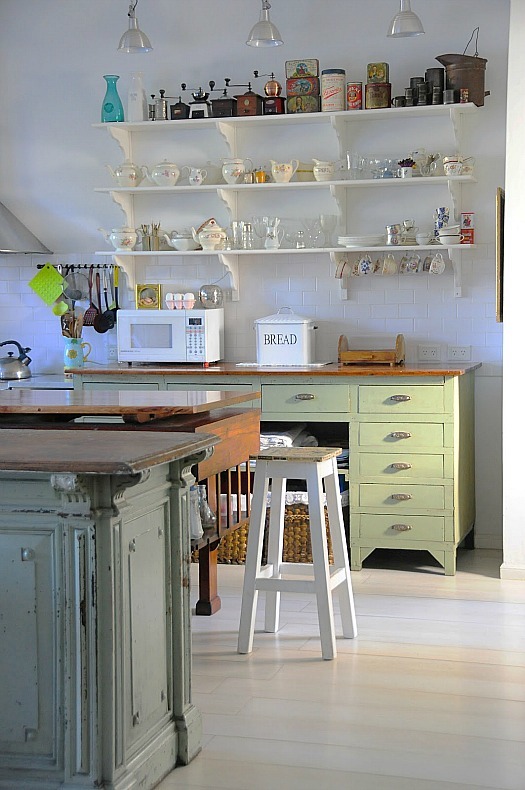 I have long loved Silvina’s kitchen, one of my favorites in blogland.